Home » book » Born to Run » Christopher McDougall » Erwan Le Corre » McDougall » MovNat » Natural Born Heroes » paleo » paleo diet » primal fitness » review » Book Review: Natural Born Heroes, or "Why Your Gym Workout is All Wrong"
Christopher McDougall is at it again. No, McDougall didn't invent barefoot running (people have done it it for thousands of years), and no, he wasn't the first to encourage it (Barefoot Ken Bob has done that since the 1980s), but Born to Run made it real. By "real," I mean the book was accessible, inspirational and made you want to kick off your shoes and run an ultramarthon before finishing the last chapter. That was my reaction, anyway. It had a lasting effect on me, too... though it helped that I landed a job at a minimalist shoemaking workshop shortly before reading the book. To this day, I only wear minimalist footwear and I cringe when I hear people claim they need heavily cushioned shoes with high arches to run without pain. Don't even get me started on the issue of the Vibram lawsuit (read my rant about it if you're curious). 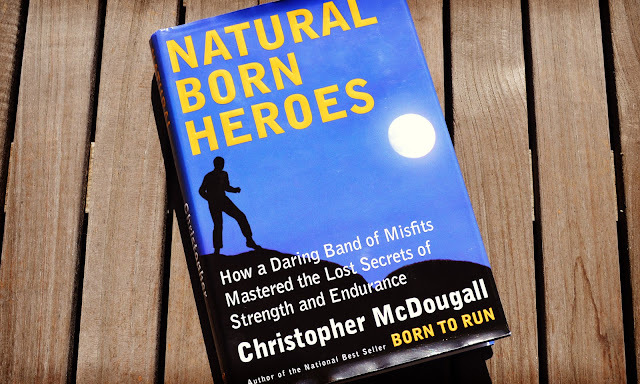 I recently sat down to recall my initial reaction to reading Born to Run in an attempt to understand why it had such a profound effect on me, and here's what I came up with: McDougall not only posed an argument to support barefoot running, but showed a way that I, yes I, could excel beyond the limits of what I previously thought possible. Distance running was no longer an elite sport that only the world's most superior athletes could take on after decades of vigorous training and the most expensive, scientifically advanced footwear; it was something that was within my grasp, and the secret was simply to let go of the unnecessary gear and conventional beliefs that told me otherwise. In other words, it was liberating. It was like finding a magic elixir that gave me a super power, and I couldn't wait to show the world what I was capable of doing. Screw that podiatrist who said I've never run without pain and needed orthotics to treat my plantar fasciitis! And yes, I really did show her. I was very curious to see how McDougall would follow up his previous bestseller, and at first glance it seemed he was going in a completely different direction. The book's description led me to believe it was little more than a historic account of a World War II mission that intended to honor a band of underrated allied heroes. It turned out to be a lot more than that, in the way that Born to Run was a lot more than just a story of how a race was created in the Mexican dessert. The first chapter sets the stage: the year is 1944 and a German general is kidnapped right under the Nazi's noses on one of the most heavily guarded military bases in Europe. The escape route is confounding German investigators, to say the least: they're on a small island surrounded by seemingly impassable cliffs and rocky boulders as far as the eye can see. As McDougall embarks on a quest to retrace the kidnapper's steps on the island of Crete and unravel the story behind the caper, he raises a simple question: what makes a hero? What causes a person, who has evolved to prioritize self-preservation above all else, to put one's own life at risk for the purpose of saving another human being? And what is it that transforms a "normal" mild-mannered person into hero material? Many real life heroic examples are given, ranging from Lawrence of Arabia to a short, middle-aged elementary school principle who saved her students by taking down a crazed, muscle-bound machete-wielding army vet using only her bare hands. I really meant it in my opening sentence when I said that McDougall is at it again, because Natural Born Heroes follows, more or less, the same formula as Born to Run. I say that in a positive way. It's McDougall's style of juggling an unconventional theory with scientific evidence, real life examples and an intriguing story to keep you captivated until the end. I personally think it works very well: without the story I'd lose interest and get bored, and without the theory I wouldn't walk away with that liberating feeling of "yes, I can do this to improve my own life!" And yes, I did have that inspirational feeling again. In this case, the theory is for something that goes well beyond your bare feet: primal fitness. Nike isn't the bad guy this time, it's Arnold Schwarzenegger. He's the one McDougall blames for distorting the image of what it means to be fit. Instead of developing practical survival skills like jumping and climbing, people are now swarming to gyms to unnaturally target muscles with weight machines. Tear them apart, break them down and juice up on 'roids to get your ripped chest as artificially swelled-up as possible. No, you won't be able to climb through a window to save a child from a burning building like the skinny French guy next door, but your friends will think you look great... and maybe the superficial girls you're trying to impress, too. And what about that skinny French guy who's climbing through the window? That would be Erwan Le Corre, founder of MovNat. I jokingly refer to him as the Barefoot Ted of Natural Born Heroes because he plays a simliar role as the guy who went against the grain and figured it out on his own. Erwan's primal fitness method is both practical and accessible because it taps into your natural potential... and it's FUN! Forget about the gym—spend a few afternoons heaving boulders with Erwan and you'll know what it means to be fit. Personal aside: I have to admit some bias here because I was already a big fan of Erwan Le Corre. I've posted his MovNat videos on Soft Star Shoe's social media pages for years now, and he contacted me through my job earlier this year, months before I read the book. Bragging time: his whole family wears Soft Star shoes and he recommends them to his MovNat students, including UFC champ Carlos Condit. I literally did a double take when I read his name in the book. 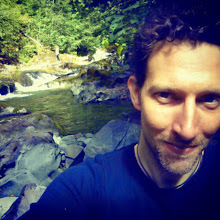 In all our interactions, Erwan never once mentioned to me that he took Christopher McDougall into the Brazilian rainforest to teach him MovNat techniques. Oh, by the way, you're eating wrong, too. Carb loading before a long race? That's the elevated heel of running diets. McDougall dives head-first into the old debate between Tim Noakes and Phil Maffetone. Noakes was the guru on carb loading and his publications over the past several decades have set the standard for how runners should fuel their bodies for racing—still held today in virtually every issue of Runner's World magazine. Maffetone's weird low-carb/low-heartrate plan was always the oddball, even though more than a few elite athletes swore it was the secret to fat-burning, injury prevention and endless energy. But guess what? It turns out Maffetone was right all along, and even Noakes admits that now! Yes, there's a strong push for what is now known as the paleo diet. If the Tarahumara knew you didn't need Hokas to run painlessly, the Cretans knew you didn't need gym weights and sugar to be in better shape than... well, everyone else in Europe. Jumping back to the 1940s, these lessons were learned by freedom fighters Xan Fielding, Patrick "Paddy" Leigh Fermor and George Psychoundakis (dare I say it, the Caballo Blancos of this story). They're the ones who learned from the locals and challenged the Nazi's image of impenetrable strength with a zany kidnapping plan. And that's where the book comes together. It's not just the story of an against-all-odds WWII mission,. It's also not just an argument that you could be in better shape if you climbed a tree instead of going to the gym (and ate more steak and less doughnuts). What it is, in the end, is a meshing of the two that puts you in the place of the story's heroes. You can put these ideas into practice, you can be a hero when the time comes and you can be the one who breaks conventions and transcends expectations. And it's easier than you think. There's that magic elixir again. There's that liberating feeling of "yeah, I can really do it" and prove a few more doctors wrong—not that I have any more to contest. Walls are broken down and I can't wait to see what my body can really do. The war story was hard for me to follow, largely due to the extensive list of characters. I found it fascinating, but there were a lot of jumps in the timeline and I had difficulty keeping tabs on who was who, who trained who, and who was actually part of the mission versus who wasn't even on the island. I suppose this was necessary for an accurate historical telling of events, but sometimes it felt like trying to follow the characters of a Russian novel without knowing all their nicknames. The theme of the book seemed to change, leaving my concept of where it was going to feel lost and confused. That initial question of "what, internally, turns someone into a hero?" is apparently forgotten halfway through the story and is replaced with "how do you really get into great physical shape?" While I like where it ended up, I felt I finished a different book than I started. Later, I put together the connection McDougall was making, that health leads to heroism and heroism leads to health. I just feel it was a scattered, side-stepping dance to get there. Nonetheless, I found the book very inspiring and it's already having an impact on my life. Ever since I read it, I've steered clear of the gym and spent more time exercising outdoors, even connecting with a nearby MovNat instructor. I bought a heart rate monitor and now follow the Maffetone Method for my runs. I was already trying a paleo diet, though with regular cheat days, and I'm now taking it more seriously. But you'll hear more about all of that in future posts. For now, go find Natural Born Heroes. It's a good read. Note: this is not a sponsored review. I bought my own copy of the book and all thoughts and opinions stated here are purely my own.